Pedoclimatic (soil and climate)conditions, along with the vine training method, explain the most commonly seen soil management techniques. The soil is worked with surface tools (rotary hoe, harrow, cultivator, etc.). This traditional technique is used especially for soil with low water reserves such as the “groies”. 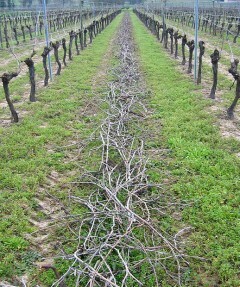 Deep plowing accompanied by hilling up and plowing back the vine stocks has long since fallen out of practice. 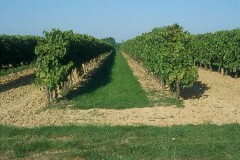 Grass cover is now common in many vineyard parcels. The relatively high water reserves and the way the chalky sub-soil restores water to the vine in summer enable it to compete with grass. Grass presents numerous advantages for the winegrower. First and foremost it protects the soil: a tractor can enter a parcel shortly after rainfall, to treat it against disease—downy mildew in particular – if need be, without causing damage. Moreover, it limits working the soil, which would increase the risk of chlorosis (leaf discoloration of varied intensity, due to a lack of chlorophyll), by grinding up limestone rocks; it also limits soil erosion, encourages development of fauna that prey on rodents and improves the soil’s water absorption. 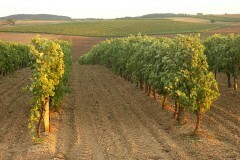 Environmental issues are high on the region’s agenda and usually herbicides are only applied directly beneath the rows. Many parcels are managed in multiple ways, for example weeding beneath the rows, planting every other row with grass cover and every other one plowed. Mineral fertilisation is most common. The high level of organic matter in these soils and the limestone which slows their degradation often make it unnecessary to use organic additives. In addition, canes converted to mulch, on site, make up for a good portion of the decrease in humus. The development of grass covers is raising the issue of nitrogen fertilization. Potassium, magnesium and phosphate additions are intended to make up for nutrients lost in the harvest, but reserves accumulated in the soil over the years make it possible to avoid new additions in many instances.